Prunus sp. 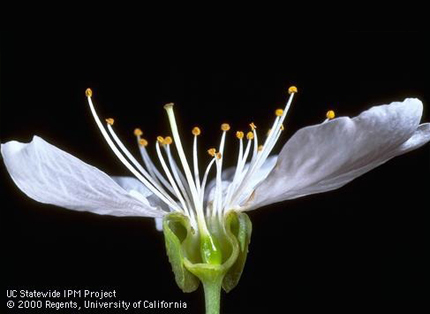 flower structure.Photo JK Clark.© Regents, University of California.fruitandnuteducation.ucdavis.edu (Both Accessed (/2014). 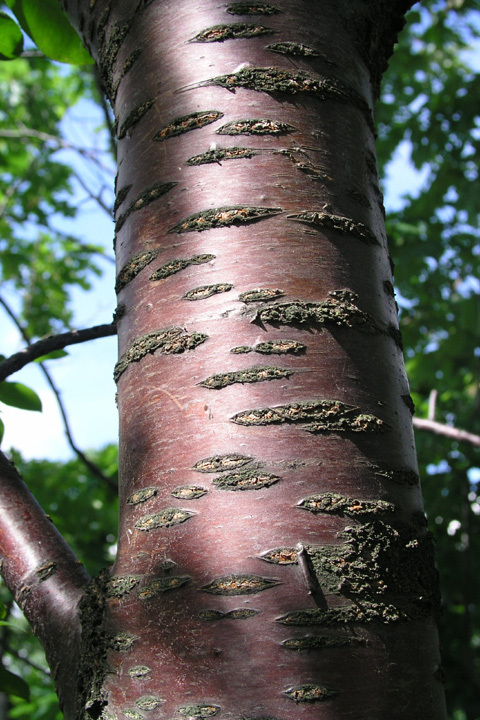 Prunus is a genus of trees or shrubs, the bark usually with characteristic horizontal stripes (lenticels), otherwise smooth, usually shiny. Often becoming rough and very dark in age. Leaves alternate, simple, margin toothed usually with two glands at the junction with the leaf stalk (petiole). Leaves of some species contain toxic levels of cyanide in the form of amygdalins. These are broken down by various enzymes and cyanide is released (Kingsbury 1964). Flowers usually white, sometimes pink or red. Radially symmetrical, five parted, petals arising from a cup-shaped structure (hypanthium) that surrounds the ovary, stamens about 20, pistil solitary. Fruit fleshy, (exocarp; a drupe), around a hard stone (endocarp) that surrounds the seed. Seeds of some species are toxic due to cyanide content (Kingsbury 1964). Notes: includes a number of common commercial crops such a plums, (many species), peaches (P. persica) and sweet cherry (cultivars of P. avium).